The combo just can’t be beat. It makes for one of the easiest dinners ever and yet it’s still packed full of protein, veggies and flavor. If pressing tofu, either use a tofu press OR place the tofu on a paper towel lined plate. Add another layer of paper towel on top of the tofu. 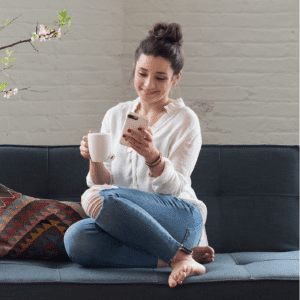 Place something heavy on top (like cookbooks or a tea kettle) and let stand for 20 – 30 minutes. Then cut into squares. 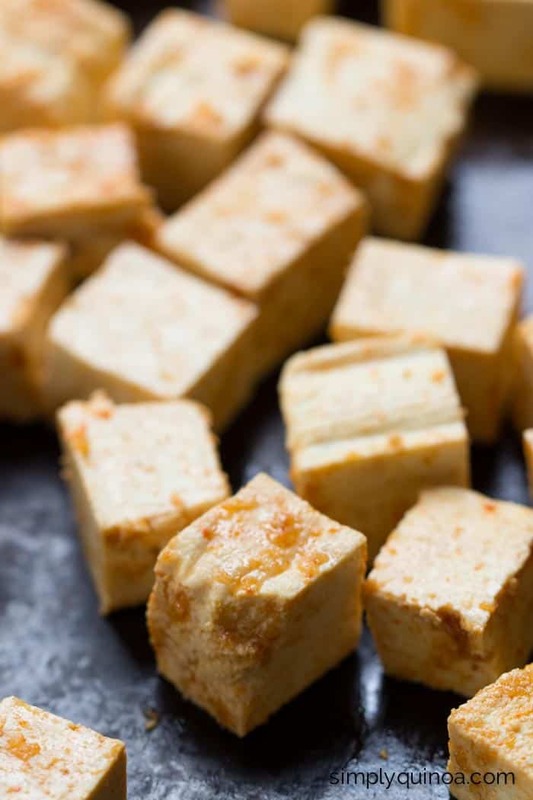 If not pressing the tofu, cut immediately into squares. 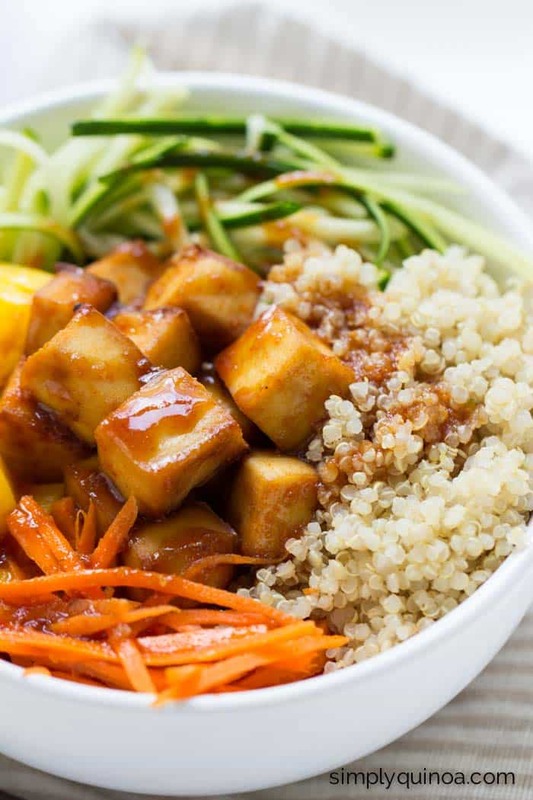 Add tofu to a large mixing bowl. In a small bowl whisk together the marinade ingredients. Pour over the tofu, mix and let stand for at least 10 minutes. Transfer tofu to a baking sheet. 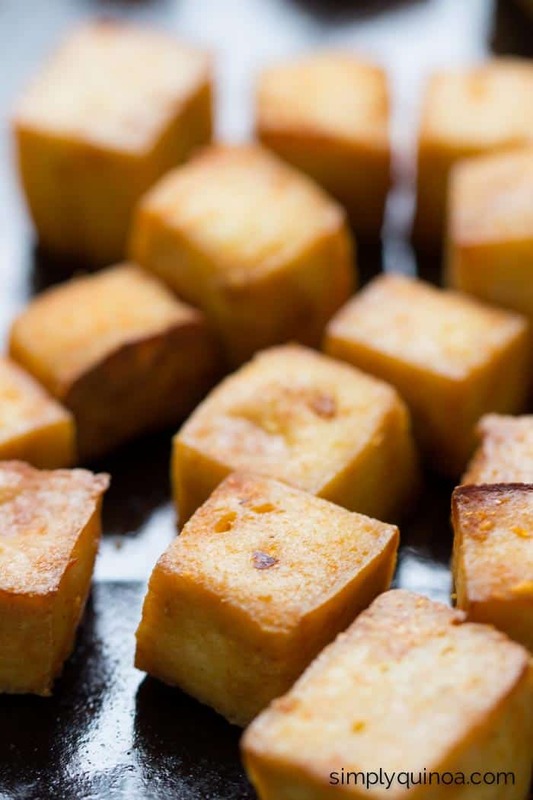 Bake tofu for 35 – 45 minutes until nice and crispy. Flip tofu over part way through to ensure even cooking. When done, remove from oven and prepare you bowls. 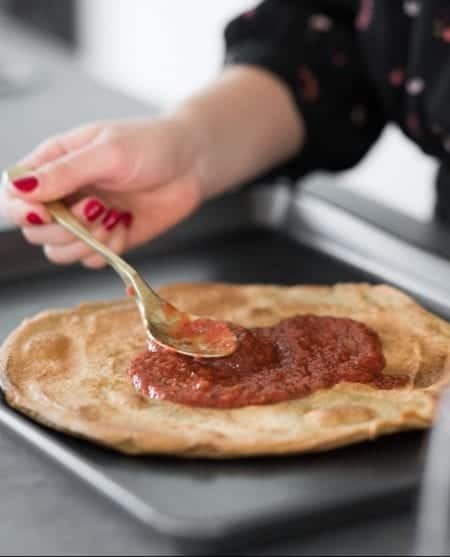 Whisk together sauce ingredients in a small bowl, then evenly distribute the bowl ingredients into two serving dishes and top with sauce. 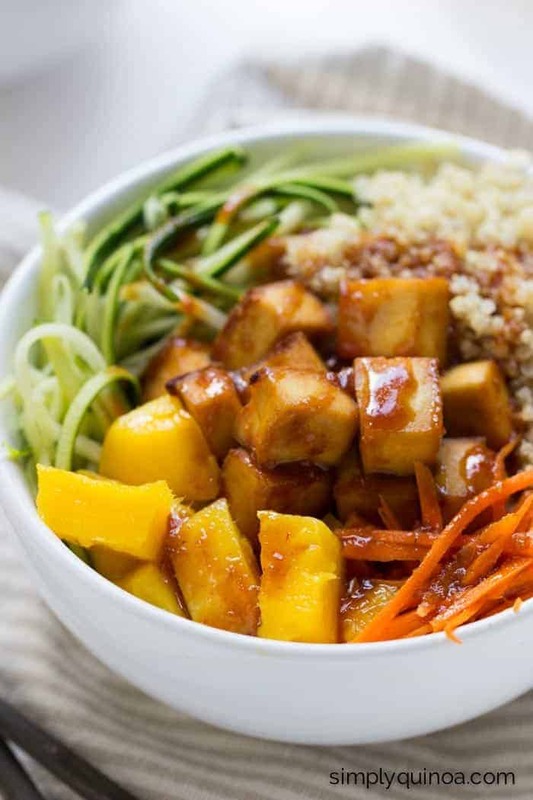 Once again, quinoa bowls are on the menu. Pretty typical at chez Alyssa these days. Just me, a big bowl of quinoa, some fresh veggies and lots of sauce. It doesn’t get much better. And that’s probably why my obsession with these little bowls of goodness continues. 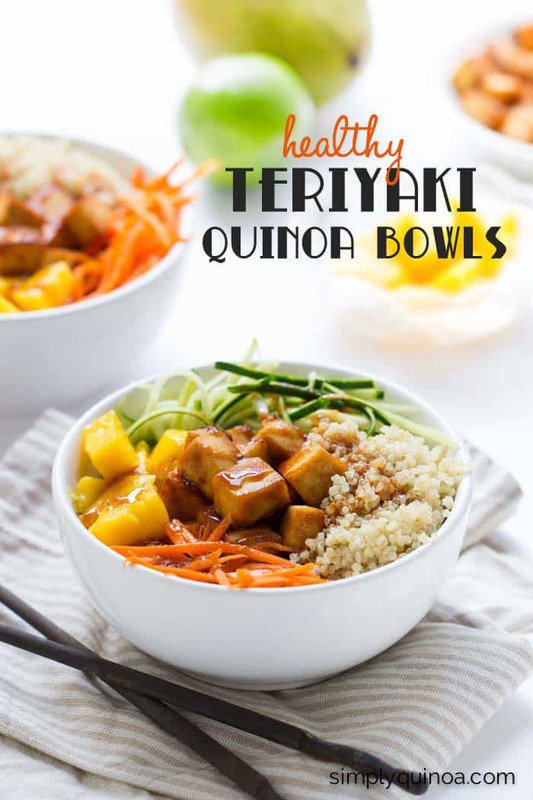 These teriyaki quinoa bowls are a healthy twist on a not-so healthy Asian dish. They’re kind of like vegified lo mein. Not vegetarian lo mein per se, more like lo mein flavored veggies. but without the noodles. and with quinoa instead. Does that even make sense? I’m confusing myself. Moving on. All we really need to know is that they’re delicious. A three-times-per-week-for-dinner kind of delicious. 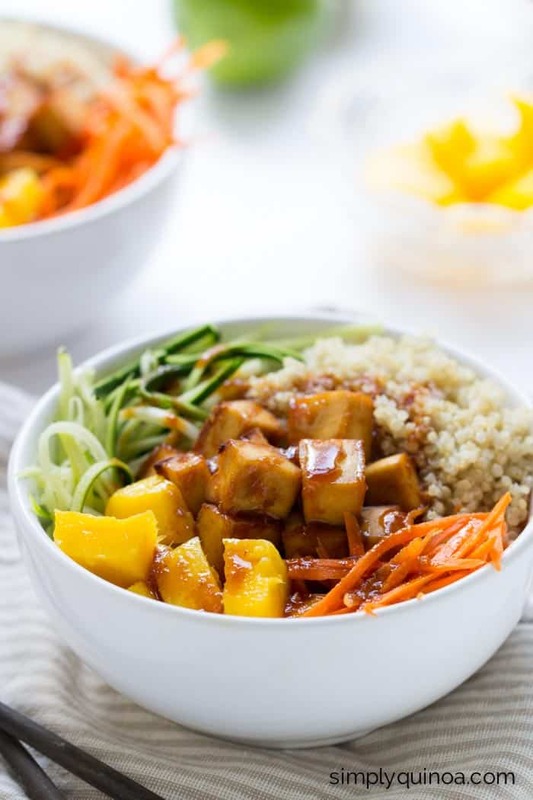 With fresh veggies, crispy baked tofu, fluffy white quinoa, juicy mango and a healthy teriyaki sauce, we go from sweet to savory to sweet back to savory with almost every bite. Flavor explosion in your mouth. 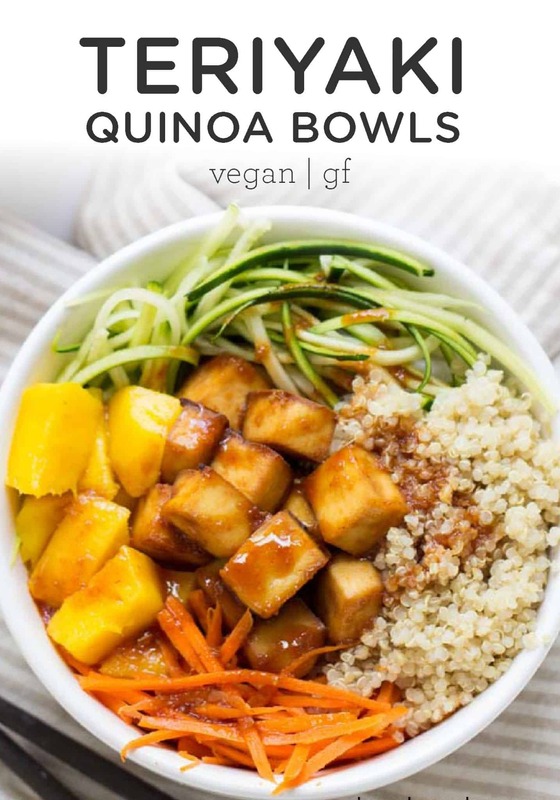 The concept of these particular quinoa bowls has evolved over the past few months. We used to make them with steamed veggies, cooked quinoa and a protein (chickpeas for me, chicken for Matt). Then we got lazy from the steaming and just went with chopped veggies. But big chunks of raw carrot, broccoli and pepper kind of took the whole dish over and you lost the other parts. So I turned to my spiralizer. Teriyaki + noodles are a classic, so why not spiralized the veggies? You’d get the effect of lo mein noodles, but still get the nutrients from eating vegetables. Seemed like a win win. 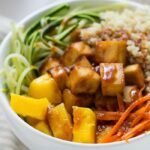 Initially I used my big countertop spiralizer, and tried a bunch of different veggie combos. I settled on carrots + zucchini because the carrots have a nice crunch, but also add a little sweetness, while the zucchinis are more mild and have a softer texture. They pair perfectly together. Problem was…I can never seem to find carrots big enough to use in the countertop version. So I used this awesome little handheld julienne slicer and it was perfect. The veggies were cut like noodles, but smaller and way easier to eat. I totally loved it in this dish. It was bright, fun and gave the whole dish a little more freshness. It really soaked up the sauce and brought out the flavors. Adding fruit to my meals might become a regular occurrence…would you be mad? Next up was the quinoa. It’s just my plain old white quinoa recipe. My standard in my quinoa bowls. As you’ve probably heard me say a bajillion times before, I like to make a big batch of quinoa on the weekends and keep it for the week ahead. And it’s for these meals exactly. 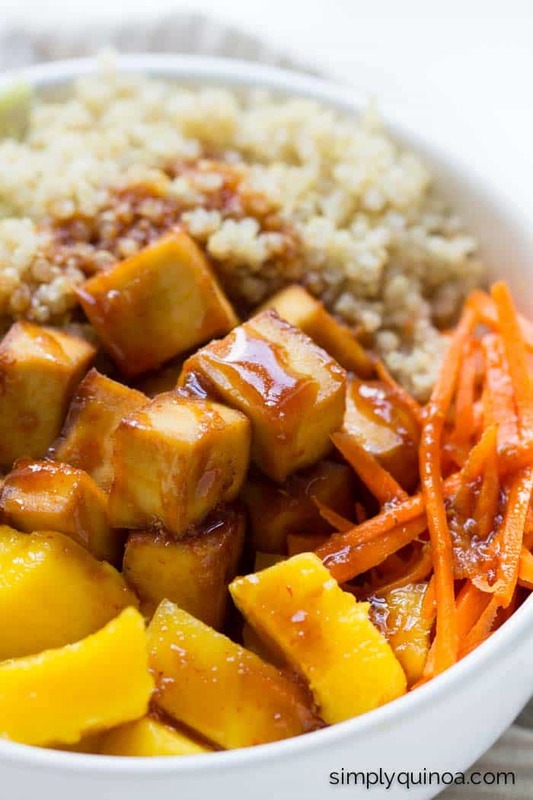 Cooked and cooled quinoa is great in quinoa bowls, salads, for breakfasts, adding to smoothies, you name it. But the trick is, it needs to be cooled. When you use quinoa that's piping hot and mix it into things, it gets super sticky and you don’t get that same texture to your meal. I’m hooked. It’s crispy on the outside and soft on the inside and adds a bunch of plant-based protein to the meal. Plus, it’s super easy to make. If you have the time, you can press the tofu for 20 – 30 minutes, but if not, just make sure you buy the firmest tofu you can find. Super firm is where it’s at. I like to get this kind because it’s organic, non-GMO, and sprouted – meaning it helps aid in the absorption of nutrients. I tossed it in a quick marinade then simply baked the tofu on a baking sheet until nice and crispy. 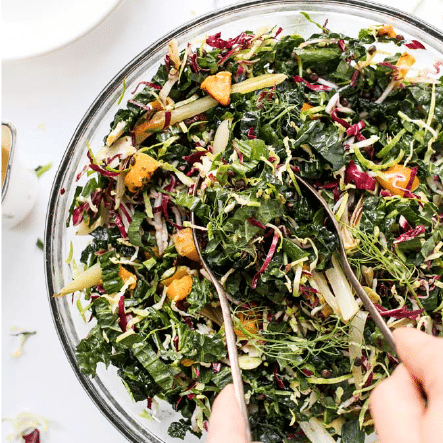 It comes out kind of puffy and is a great, plant-based addition of protein to the bowl (but also amazing in salads too!). Oh my goodness this sauce. It needs to be on everything. It’s salty, spicy, sweet, tangy, garlicky and ginger-packed. And it pulls the entire bowl together. I’ve been making it daily and can’t get enough. The combo of ingredients is perfection AND it’s a healthy alternative to the stuff that comes in a bottle. No additives, preservatives, nada. Just pure ingredients and TONS of flavor. You’re going to love it. So grab some chopsticks peeps – and get your bowls ready. 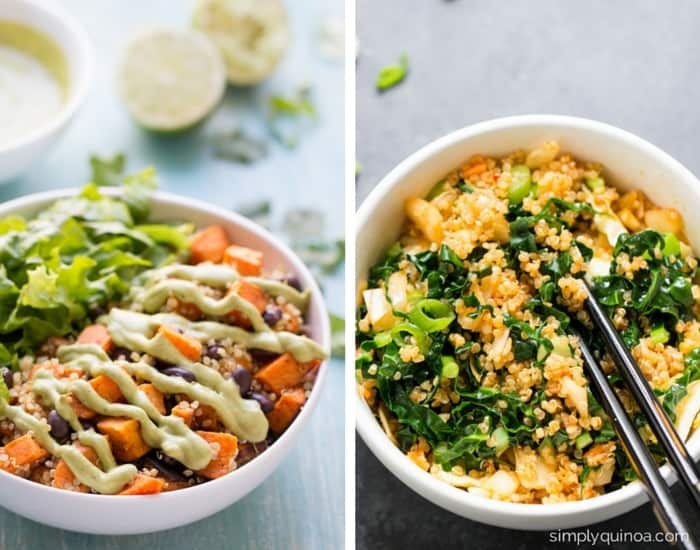 Quinoa bowls for-EVER! 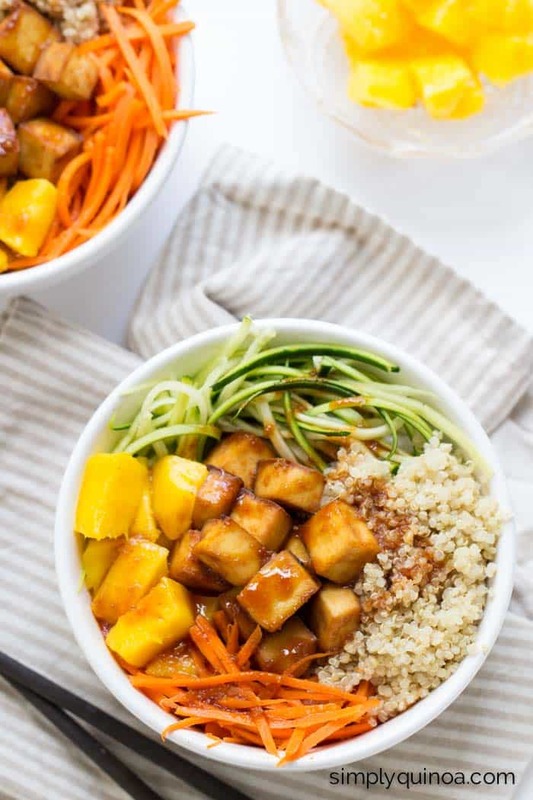 These vegetarian teriyaki quinoa bowls are the ultimate dinner! 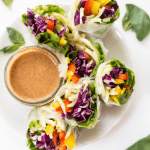 They're light, flavorful and are great for meal prep! If pressing tofu, either use a tofu press OR place the tofu on a paper towel lined plate. Add another layer of paper towel on top of the tofu. Place something heavy on top (like cookbooks or a tea kettle) and let stand for 20 - 30 minutes. Then cut into squares. Bake tofu for 35 - 45 minutes until nice and crispy. Flip tofu over part way through to ensure even cooking. When done, remove from oven and prepare you bowls. I can figure out which ingredients are for the sauce and which are for the tofu marinade. Can you clarify please I’d love to try this. Sorry, but still isn’t clear on your site. I think you have the marinade ingredients listed as Sauce. OK, this sounds terrific. I’m not a vegetarian so I think I will do chicken instead of the tofu. But I have a question. I have recently purchased a spiralizer, and haven’t used it yet. When I spiralize the zuchinni, do I stir-fry it with the carrots, or are they just raw. I hope that isn’t a dumb question. The recipe doesn’t really say. I bought the spiralizer to start getting more vegies, but I need a little guidance. Thanks! Thanks for sharing this recipe.. I am food blogger and I really loved your way of presenting it.. I loved this, My husband loved this. My daughter heard me bragging about it and asked me to save her a portion. She loved it!! Perfect combination of taste and textures! Thanks for posting!